Haujobb are part of the newest wave of electronic dance acts to come storming out of Europe. Along with such other notables as :wumpscut: and VNV Nation, Haujobb are bringing, if possible, an even newer surge of adrenaline to a genre that already seems expanding to burst. Haujobb formed as a trio in 1993 in Germany, with B. Junemann being the third member to the current duo of Dejan Samardzic and Daniel Myer. Their first release was on cassette only, the now hopelessly out of print Drift Wheeler. This embryonic issue brought them to the attention of Off Beat records, who released their first CD, Homes and Gardens, later that same year. Haujobb's first German tour occurred in 1994, along with the American release of Homes and Gardens and their first single, Eye Over You. In 1995, Haujobb attained its current configuration with the departure of B. Junemann. The duo went on to release their second CD, Freeze Frame Reality, and began doing remixes for other bands, including Front Line Assembly and Download. The Frames CD was released, which featured both new material and a number of remixes done by such luminaries as cEvin Key of Skinny Puppy/Download, Adi Newton of Clock DVA, and Mentallo and the Fixer. In the midst of all this activity, a second tour of Germany was successfully launched. During 1996 the band took part in The Remix Wars Part 1 - :wumpscut: vs. Haujobb, in which each band remixed several tracks from each other's repertoire. It also saw their first full European tour, as well as their debut on America's Metropolis Records, with the highly successful Cleaned Visions single and their drum and bass influenced full length CD, Solutions for a Small Planet. 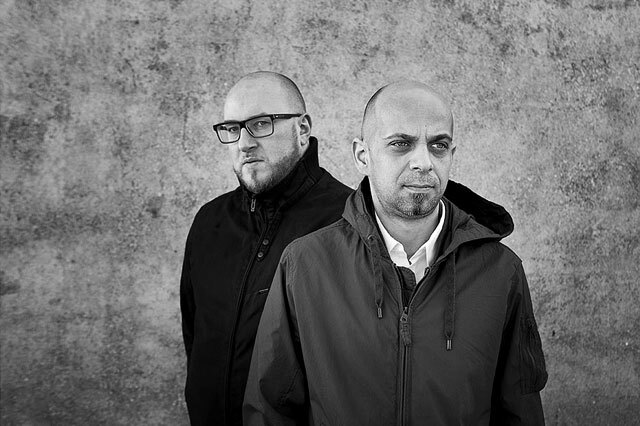 In 1997 came the release of their double EP, Matrix, with one disc of new and remixed electronica material and one disc of samples, while 1998 saw the release of two side projects, Newt and Cleen; as well as the release of the single Less. The second Cleen product, Second Path, with the Haujobb electronica CD, Ninety-nine, both hit the street in early 1999. The remixes from that album, Ninety-nine Remixes, was released in late 1999. The long awaited return of the architects of sound, Haujobb has finally occurred. Polarity marks the end of a two year hiatus for Haujobb, who take this release to the edge of electronic extremes and beyond. Quite possibly their best album ever, Polarity is packed with electro break beats, ambient structures, and tweaked intricacies that deliver a wide spectrum of sound to fill the quietest void or largest chasm. Embark on a kaleidoscopic journey as Haujobb lead you between extremes of Polarity. After releasing the highly anticipated Polarity album in 2001, Haujobb returned eight months later with yet another new single, "Penetration". The single gave great incite into what to expect from the new album, Vertical Theory. As Daniel Myer, mastermind behind Haujobb, described the album "a little trance, a little EBM, a little industrial, a little ambient, and a little bit dance, but with that Haujobb 'feel'." Almost two years after the release of the album Vertical Theory, Haujobb returned with an album of remixed and reinvented tracks. Highly sought after for their legendary remixes, Haujobb now has the favor returned to them by their friends including well known acts such as Glis, Seabound, and This Morn’ Omina. In addition, Vertical Mixes contained two new tracks and mixes from Haujobb themselves. In February 2009, Metropolis Records released the out of print Freeze Frame Reality as a digital only release. Frames-The Remix Album was digitally released the following May.